The concept of a 12″ vinyl EP of bird song is not an idea that immediately jumps to mind. I will therefore admit to feeling a little bemused when I first heard that innovative publishers The Sound Approach had released exactly such a thing, entitled The Beauty of The Sound Approach. Having spent my teenage years delving in to my parents’ old record collection and subsequently developing a deep interest in electronic music, I’ve grown up with vinyl – yet I didn’t have anything ‘birdy’ on my shelves, so I was naturally intrigued. 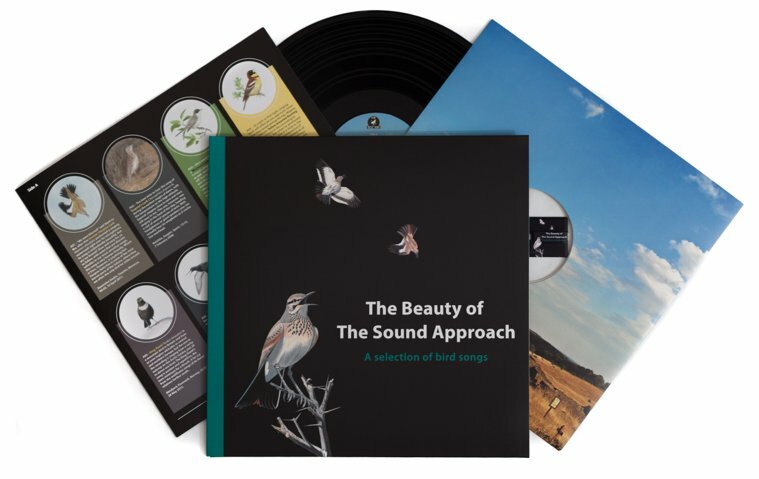 On receiving a copy, I was thoroughly impressed; it encapsulates everything there is to love about vinyl yet also manages to be a fine advertisement for exactly what The Sound Approach is – the very best in bird acoustics. Design is such an important part of any vinyl release and this most certainly excels, but what about the record itself? Side A is a dedication to individual bird songs (the exception being Red Deer) from various ecosystems around the globe. Each is very individual, creating its own distinct ambience and resonating with the listener in different ways. Knowing the dire plight of Yellow-breasted Bunting, I couldn’t help but feel melancholic as I listened to a male utter its beautifully rich yet charmingly simple refrain from a perch in eastern Siberia. In contrast, it’s hard not to smile at the excitable chattering of Marsh Sandpipers as they gather on a Russian floodplain for the forthcoming breeding season. While side B is also listed as individual species, by the producers’ admission, they are less focused on individual performers and more on the general ambience of a setting. Again, the mood of these varies greatly – from the freneticism of a group of Long-tailed Ducks or the familiar urban bustle of House Sparrows and Feral Rock Doves to the almost haunting bellow of a Eurasian Elk echoing around a Polish marsh. A favourite of mine, however, was recorded in Kuusamo, Finland, in the early hours of 9 June 2010. I don’t want to spoil it – just have a listen. It’s utterly fabulous. Vinyl is loved for the richness and clarity of sound it is able to convey and each recording on The Beauty of The Sound Approach is of such high quality that, when powered through a good sound system, makes for a genuinely spectacular acoustic experience. Without wanting to be too clichéd, the recordings are so exquisite that on closing your eyes it is very easy to imagine yourself there, in the moment, as if you were the listening dish taking it all in. Playing the record in the dark made it all the more atmospheric. There’s also a USB stick included with further recordings and biographies of the team involved – a nice additional feature that again demonstrates the thought that has gone in to this product. A pull-out sleeve provides notes on each recording, with each ‘track’ described succinctly yet evocatively. The concept of this product is a little niche (only a minority has access to a record player at home these days) but with the vinyl format becoming increasingly popular again in recent years, could this be the precursor to further releases of a similar ilk? Having enjoyed this offering so much, I certainly hope so – this is a genuinely inspirational release. It is very clear that it has been curated with an immense amount of care and thought by a team at the top of their game. Each recording is moving, stirring and educational in its own way. Some will find they evoke fond memories, while others will no doubt be motivated to seek new experiences off the back of a listen. The Sound Approach’s aim has always been to popularise the study of bird sound and raise standards in this field. This certainly achieves that.